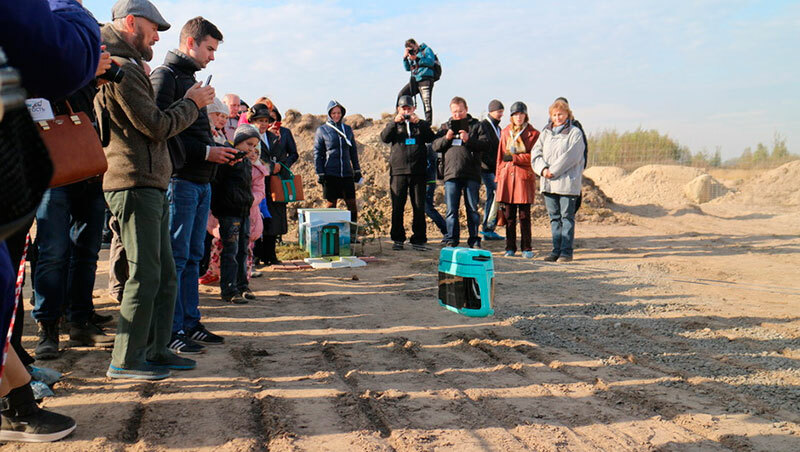 Solemn opening of "Zero kilometer" took place on October 17, 2015 on the territory of the SkyWay EcoTechnoPark near the town of Mariyna Gorka (Minsk region, Republic of Belarus). 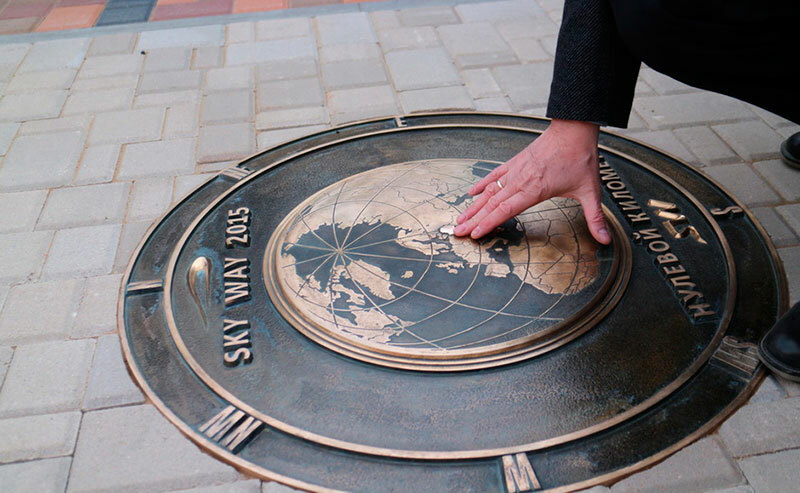 Actually, it is a plate of 250 square meters in the form of a large-scale map of Belarus with a bronze sign in the shape of the globe, which marks the beginning of the first SkyWay track in history. SkyWay is a unique, innovative and breakthrough transport technology developed by engineer Anatoly Yunitskiy. SkyWay is an information, energy and transport communicator of overpass type, based on string-rail technologies. The peculiarity of this technology is its environmental friendliness; therefore the existing natural landscape and the surrounding flora and fauna are not disturbed in the area of construction of transport overpasses. Distinguishing features of the SkyWay are safety, affordability, reliability and high level of profitability. SkyWay EcoTechnoPark is not an ordinary object, it is the center of practical implementation of SkyWay innovations, their international certification and expertise. It is not even the Skolkovo innovation center in Russia, created by officials. It will be more likely similar to the Silicon Valley in the USA, created by business and for business, from where all modern electronics came out to the world markets. 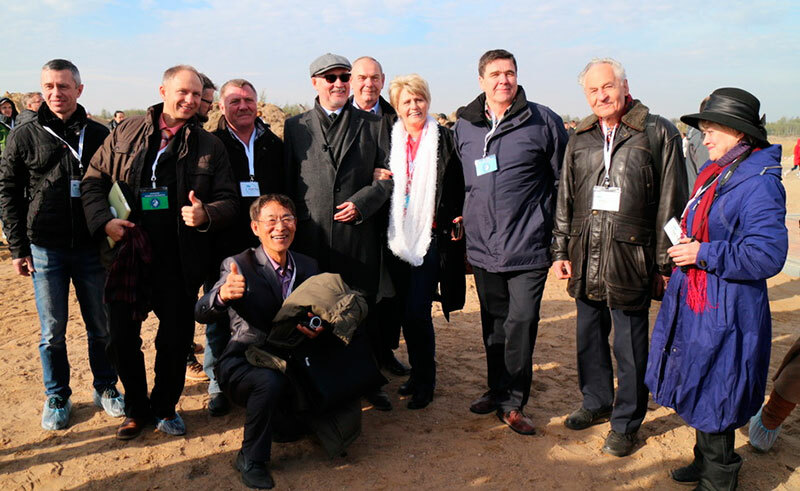 The opening ceremony was attended by the Creator of the technology Anatoly Yunitskiy, heads of partner companies and the first SkyWay foreign investors from Russia, Germany, Norway, Kazakhstan, Turkey, Lithuania, Latvia, Estonia, Moldova (partners of the SkyWay international group of companies live in 47 countries). They were the first to believe that the future is for these technologies. Also present were major investors that have provided the greatest help to the development of the project, as well as representatives of local authorities. "I've been approaching it for almost 40 years. Those people who were the first to believe and invest their funds, and that is about 100 people, - were waiting for it 20, 15, 10, 5 years. All of our investors, including those who came to the SkyWay program through foreign partners, and that is more than 100 thousand people, are all involved in the creation of "EcoTechnoPark" in Mariyna Gorka. This construction would not have been started without them. "Zero kilometer" is the beginning of realization of my youthful dream to encircle the globe with SkyWay routes: safe, comfortable, efficient and environmentally friendly. If this is not done, the existing transport, primarily automobiles, will kill more than 100 million people by the end of the XXI century and more than 1 billion will become disabled and crippled. And how many billions of animals will die, no one knows, because such statistics do not exist. Yet we know how to reduce transport accidents by thousands of times - we need to build worldwide millions of miles of SkyWay routes by moving traffic flows from the ground surface to the "second level". The existing transport has already withdrawn from the world the land area exceeding the territory of Great Britain by five times. This soil is now dead - it is "rolled" into the asphalt and "buried" under the sleepers. However, we know how to save this soil - we need to build millions of miles of SkyWay routes on the planet, raising the track structure to the "second level". And in place of asphalt and sleepers we will plant gardens and orchards, and set up alleys, as we are doing it now here in EcoTechnoPark." 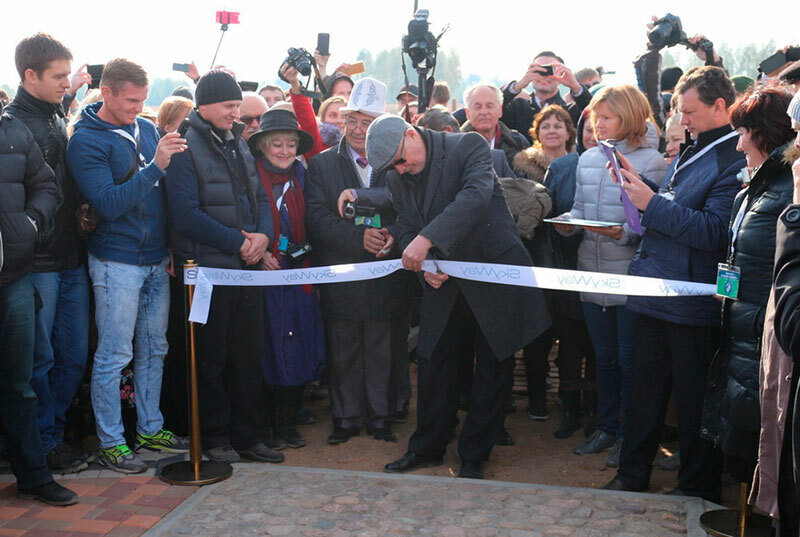 After the ribbon-cutting ceremony, participants approached the "Zero kilometer" on a special path, personally feeling its symbolized meaning for a thousand years of history of transport. Really, at first the roads were paved with cobblestones, then the builders switched to stone blocks, in the twentieth century they began to lay asphalt on stone foundations everywhere, and then to mount tram rails on it. Everyone present was greatly impressed by the demonstrative scale model of a suspended unibus brought for testing. No less interest was aroused also by the reduced model of suspended track with stations and supports. All of these elements of track structure have to handle appropriate loads in the same way as full-scale units of the system under construction nearby will be able to cope with. It is hard to overestimate the importance of the sign "Zero kilometer" opening. It is not just a point of reference for SkyWay routes. "Zero Kilometer" will be the beginning of a new life, a new way of thinking, new opportunities and discoveries. This is a new stage in the development of SkyWay technologies. This symbol has started a new transport and infrastructure industry on planet Earth. 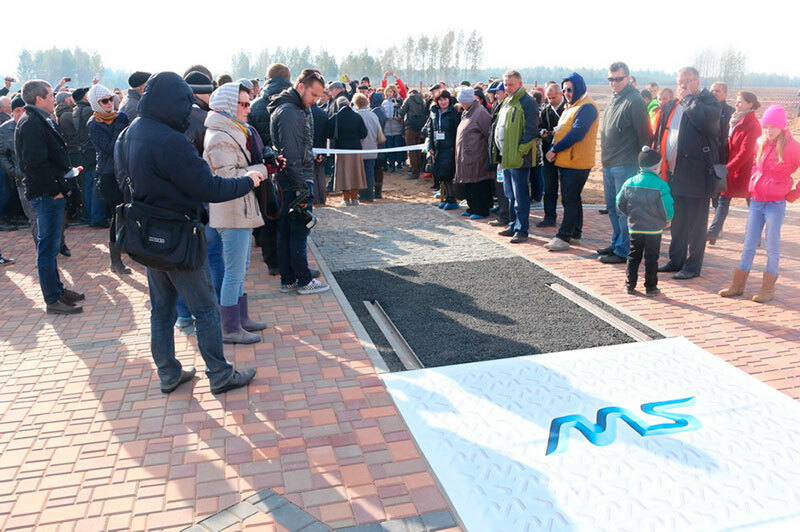 Very soon in Mariyna Gorka, the whole world will be demonstrated with test sections of commercial samples of freight, urban and high-speed SkyWay tracks with total length of about 20 km. These tracks and their infrastructure are unparalleled in the world. They are ahead of all presently existing and promising transport systems by several times - and manifold on some parameters. 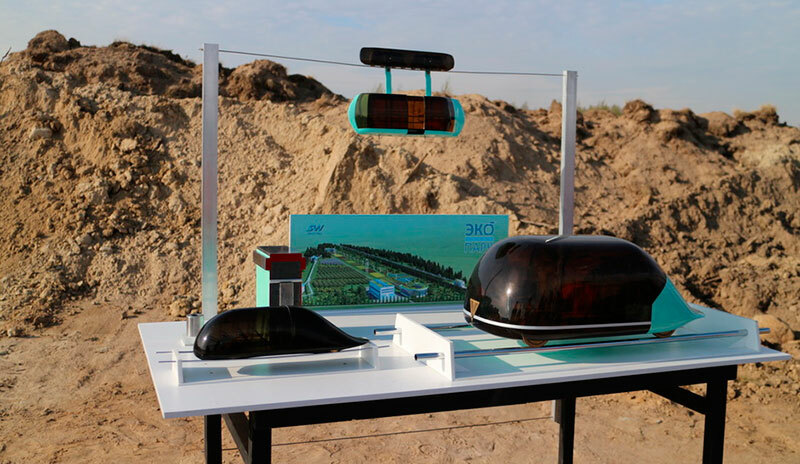 This event was followed by honoring the investor of the SkyWay group of companies, the first to be awarded the right to leave an impression of his palm for the memory of posterity. 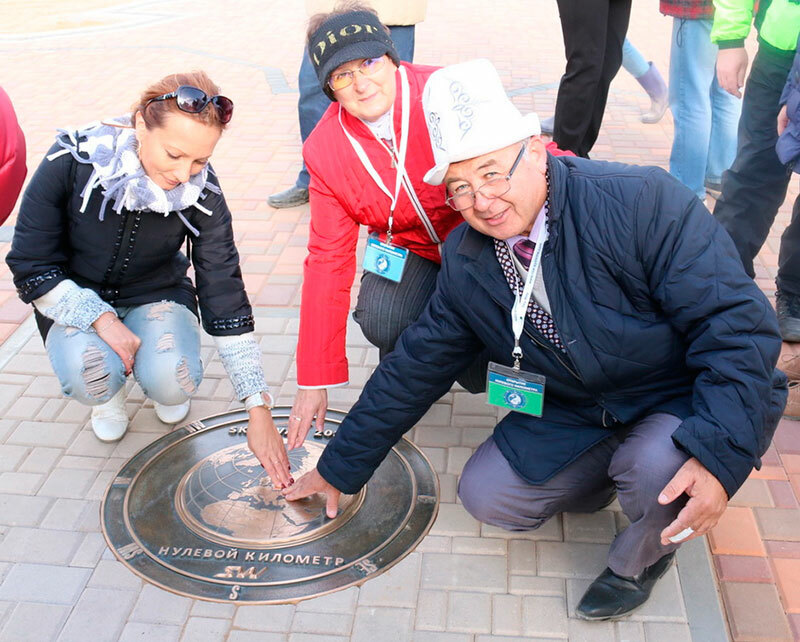 By analogy of the Walk of Fame in Hollywood, the cast of the palm of the person honored in bronze with the application of the name, surname and signature will be placed on a decorative pedestal in the alley of Honorary investors of SkyWay EcoTechnoPark. It would be reasonable to complete the report about the opening of the SkyWay sign "Zero kilometer" with the idea expressed by many guests of this gala event - we are proud that Belarus had become a place where we are building the Center for practical implementation of SkyWay innovations, their international certification and expertise. Transport and infrastructure breakthrough technologies, which include SkyWay routes, have the greatest potential world markets on the planet, larger than, for example, mobile phones, computers, electronics that have markets in trillions of dollars per year, though recently they were started "in the garage" and almost no one believed in them and did not give them a chance to live. And this gives us confidence that in EcoTechnoPark, which is under construction in the Republic of Belarus, transport and infrastructure SkyWay technologies will be demonstrated and certified. It will help to attract multi-billion dollar foreign investments, bring our country to an even higher level, putting it into some of the most technologically advanced countries, ensuring our descendants ecologically clean, safe, comfortable and prosperous future! 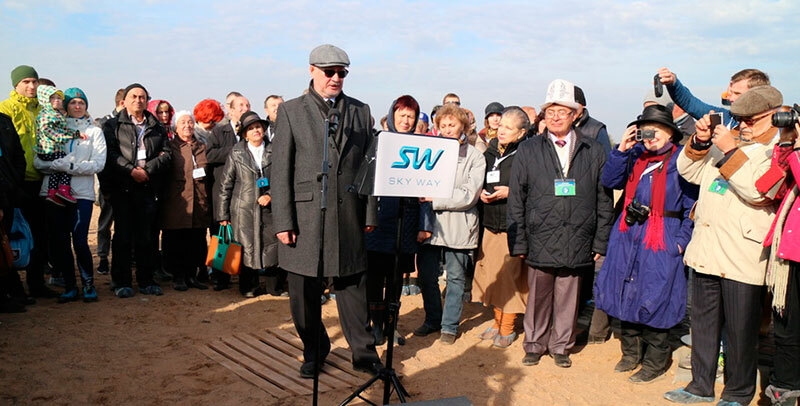 See all photos from the album "Grand opening of SkyWay zero kilometer".